DJ Khaled is on an upward climb and there is no sign of him slowing down. Last year, the hit maker released Wild Thoughts in collaboration with Rihanna and Bryson Tiller, that landed them a performance spot on the 2018 Grammys. Before that summer hit, Khaled dropped Shining, featuring Beyoncé and Jay Z, the first single from his tenth studio album, Grateful. The album was released on June 23, 2017 and had a few other celebrity features to grace it. Early this morning, Khaled released the official debut single from his next album, Father of Asahd. The single, Top Off, features none other than Queen Bey, Hov and Future. The new father has been seen all over the web and television with his son, Asahd. The two have even graced red carpets in matching outfits. To say he is a proud father is an understatement. The young mogul was the cover photo for his dad’s album, Grateful and now appears alongside his dad for the single cover shot. Khaled announced the album information in typical Khaled fashion, with Asahd in tow. Hov gets a lengthy verse on the track where he mentions Meek Mill, Blue Ivy and the bar tab he supposedly ran up last month. Mrs. Hov appears in the third verse and gives the track her usual amount of Beyoncé slayage and boss talk. 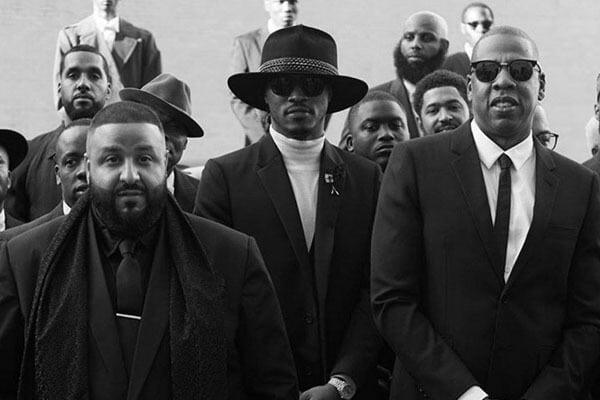 Future doesn’t have a full verse on the song, but you can certainly tell he’s on the track. No release date had been announced for Father of Asahd, but it’s said to be dropping this summer. Check out the track and tell us what you think in the comments below!